Michelle Y. Janning, PhD, is professor of sociology at Whitman College in Walla Walla, Washington, and board member of the Council on Contemporary Families. She is author of The Stuff of Family Life: How Our Homes Reflect Our Lives. Michelle Y. Janning. 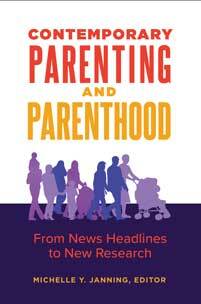 Contemporary Parenting and Parenthood: From News Headlines to New Research. Praeger, 2018. ABC-CLIO, publisher.abc-clio.com/9781440855931.